Hair growth goes through three stages, anagen, catagen and telogen. Anagen is the growing phase of the hair, lasting from two to six years and 85% of hair are in this phase at any given time. Catagen is the transitional stage which lasts for about 10 days. Telogen is the resting phase, where the follicle is dormant, it lasts for about three months and around 10% to 15% of all hair is in this phase. Telogen effluvium is the second most common form of hair loss. It describes a condition in which a shock to the system in a form of large levels of stress force the hair follicles to prematurely transition from growing to resting phase. Up to 70% of the hair is shed in a period of two months after the initial shock and people describe losing their hair in handfuls. There are many causes to stress related hair loss as there are many causes of stress. Short term hair loss often happens to women after childbirth, as the hormone levels shift during pregnancy, with a sudden peak at the birth. That peak causes such a shock to the hair follicles that they stop producing hair for a while. 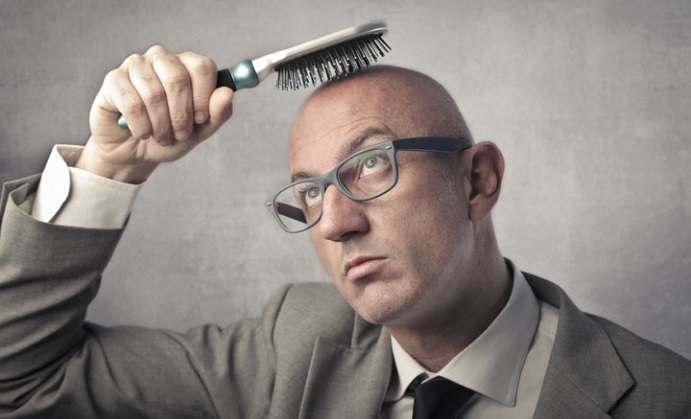 Although a substantial hair loss may happen, most of the hair regrows quickly. Other causes of hair loss include injury and physical trauma, diets and sudden weight loss, certain drugs such as antidepressants, underlying medical condition, prolonged exposure to stress, i.e. chronic stress, and even deficiency in specific minerals and vitamins. But do not worry, there are steps you can take to relieve yourself from stress. Improve your everyday diet with healthy foods, as they contain more energy required by the body to function better and, as a result, better cope with stress. Avoid processed and sugary foods and eat lean red meats which are rich in protein, and foods containing high levels of vitamin B, such as poultry, salmon, eggs and spinach, as vitamin B is needed for hair production. Other vitamins and minerals that promote hair growth include vitamins A, C and E, folic acid, magnesium, zinc and iron. Regular exercise is one the best ways to reduce stress. During exercise, the body releases the endorphin, also known as happiness hormone, which will make you feel more relaxed and calmed when you finish. Yoga is great at relieving stress and meditation and breathing exercises can be done almost anywhere. Lack of sleep can lead to both physical, as well as emotional stress, particularly if sleeping issues continue over a long period of time. Going to bed and waking up at the same time everyday improves by getting it into a regular, manageable pattern. Your body needs between 6 and 8 hours of sleep, anything less than that and it will not rest properly which may result in higher stress levels. Try to avoid stimulating activities before going to bed, such as looking at bright screen of a smartphone or a laptop. The one thing you need to have in mind is that stress related hair loss is not permanent. Give your body some time to recover, and when it does, your hair will start growing back.